The BoBunny Blog: Designer Showcase- Debbie Sherman! It's Wednesday and that means another Designer Showcase! I have loved getting to know these designer's style through their projects. As you can see each one of the Bo Bunny designers has a unique style that is just awesome! Today's designer Debbie Sherman is no exception. I can always pick out her layouts by her fun bright designs and her use of flowers. She always has flowers some where on her projects and I love that! I just LOVE all her work really! This project has to be one of my favorites! It's bright and so summery! The colors are perfect for a fun day at the playground! The new Hello Sunshine collection really fit this photo perfectly! A day at the colors in the photo helped me choose this collection. 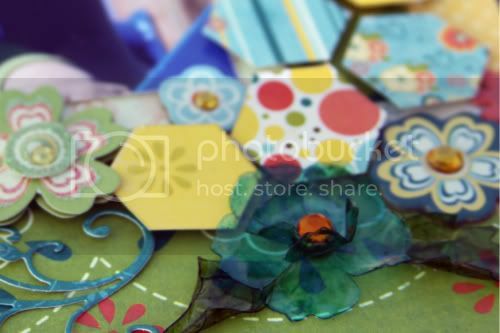 The flower embellishments were made using packaging and a favorite flower and leaf die, I simply die cut the plastic and colored with ink and heated them up to shape. 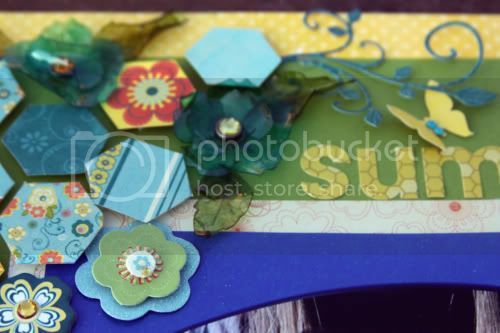 I cut out the honeycomb shapes from the various patterned papers and then popped them up with foam squares, and added Hello Sunshine chipboard to give the layout dimension. As Final touches I added flourishes and butterflies to give the layout some movement. Thanks for stopping by to visit and see Debbie's project. Please stop by her blog and say Hello (click on her name on the side of the blog) you won't be disappointed! Debbie is AMAZING!! I have been stalking (errrrr I mean admiring! *wink*) her creations for a long time!! I just loveeeeeeeeeeee this LO Debbie!! ADORABLE photo and love love love love love all the hexagons!!!!! Wonderful layout. Love the tip on the flowers from packaging. Great idea. Even though it's grey and dreary over here, the sun broke through when I saw this LayOut. It made me smile. Your layout is simply amazing! I just love how you used the ginghams and cute bees. Your work is so beautiful! This is so pretty Debbie!!! What a terrific layout. Love the idea of making flowers from the plastic. Wow! Gorgeous layout Debbie! So bright and cheerful. It says FUN in a big way.